"It Was Sort of Adventuresome..."
Captain Dale H. Dyer was a B-24 pilot over occupied Europe in WWII, flying a total of 26 missions. In 1947 he settled in the small north Georgia town of Blue Ridge, where his wife was from. He was interviewed on 8 September, 2017 at home. Coincidence: a remarkable concurrence of events or circumstances without apparent causal connection. This definition is restated here as it is central to the story I’m about to share. Originally, the goal was to photograph 50 “bomber jackets.” I figured that if I had photographed 50, that would be enough to create a solidly researched and beautifully illustrated book…one filled with unique, never before seen artwork, captivating personal stories, and portraits as possible. World War Two flight jackets, otherwise casually known as “bomber jackets,” are the subject of my first book. By the way, to date 59 have been photographed, with more to come. More properly, they are known as A-2 summer-weight flight jackets. During the war, flight crews painted their coveted jackets with depictions of their aircraft, the nose art of their plane, missions flown, patriotic scenes, and of course, pinup girls. Wildly popular with the airmen, they were the envy of many tankers, infantrymen, and others who wanted one, and many often traded, wheedled, bought or outright “pinched” a jacket. 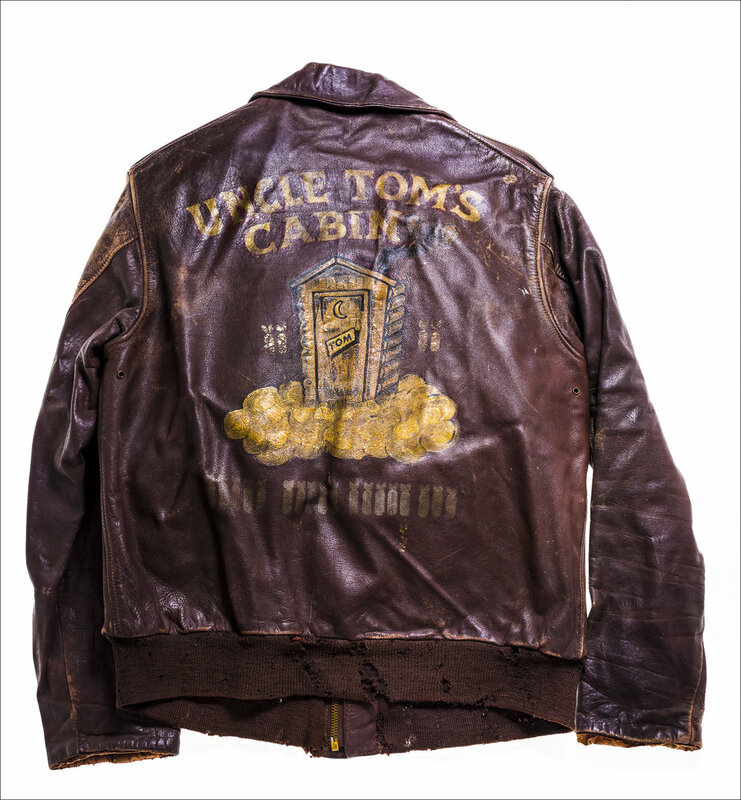 I’ve heard first-hand from an Eighth Air Force veteran that the jacket was often the first item “liberated” from an airman’s footlocker, when it was determined that the crew was missing. Such is life in the military. As part of the project, I was referred to a fellow here in Atlanta that had his father’s flight jacket. Walter Thomason had been a B-17 pilot, and the crew named his ship “Uncle Tom’s Cabin,” which was not unusual as the pilot often had some influence on how the ship was named. His son Mark was kind enough to bring the jacket to my home the week before AirVenture 2015, which I photographed along with several other personal items and mementos. The files were quickly processed and loaded into my iPad, just prior to departure. Of course, we both got very excited when he confirmed that indeed it was the same Walter Thomason, and we had goose bumps for five minutes talking about this amazing coincidence. Tom also mentioned that he still had his dad’s jacket and indeed it had been painted with the same artwork as Walter’s. A plan was then hatched to have Tom bring his dad’s jacket to AirVenture 2016, where I would photograph it too for the book. I’m happy to say that with the willing cooperation granted by the fellows in the EAA maintenance hangar, I was able to set up my gear and photograph Tom’s jacket as well during AirVenture 2016. Although it is in much worse shape (his dad wore it a lot after the war), the artwork is still visible and clearly they are a matched pair. Never in my wildest dreams when this process began did I think I’d have two jackets from the same crew, and the plan is to put them side by side in the book. Mark Thomason's dad was the pilot on "Uncle Tom's Cabin". Tom's dad Wallace was a crewman on Uncle Tom's Cabin. The crew of Uncle Tom's Cabin. Bob Hoover and Steve Hinton at the 2012 Reno Air Races. Created for Smithsonian Air & Space magazine. There are times in a commercial photographer’s life when, despite efforts to the contrary, it is just not known what he’ll be photographing next. Such was the case in 2012 when I went out to the Reno Air Races. While I didn’t have a specific assignment per se, Caroline Sheen from the Smithsonian Air & Space magazine was kind enough to wrangle a “press pass” for me, and there was an “understanding” that an assignment might crop up while I was in Reno. With that in mind, I hit the road for another photographic adventure. This is not that unusual in the editorial world, and so, knowing that I might be called on to create an image or two on the spot, I packed an ancient Norman 200B battery powered strobe, a small Chimera soft box, a small stand, and a Pocket Wizard trigger. This was in addition to my normal backpack with several lenses, a Canon 580 EX strobe, and a Canon 5D Mark II camera. Of course, my laptop was also part of the mix, for the daily download back in the hotel room. Gone are the days of shooting all day, and relaxing in the evening, out on the town. Now it’s shoot, download, process, back up, and depending on the job, upload for a client’s perusal. This usually takes more time than one might imagine, and with an early call (5 am!) the norm, sleep becomes increasingly critical as the week wears on. As a first time attendee, I welcomed the guidance that a couple of photographer friends offered as to how it all worked. The “press center” is little more than a vacant building, with a few tables, a few lockers that can be secured (if you were smart enough/advised to bring a lock...), power outlets, a few charts/notices/posters with current information (hopefully), and most importantly, the daily bus schedule that takes a limited number of photographers out to various pylons for shooting during the races. While it sounds exciting, and “The Pylons” are a very good spot to shoot the aircraft as they round the corners, it nonetheless quickly becomes repetitive. Add to that the fact that there are no “amenities” out there for shade, potty breaks, refreshment, or even a place to sit (unless you want to sit on a cactus...not advisable…), it quickly becomes a place you want to return from, as soon as the racing is over. Some folks spend the whole week out there, and my hat is off to them. I however, prefer to have a little more control, visually speaking, over my images, and thus I spent a fair amount of time looking for images that others may have overlooked. While it sounds a bit snobbish, in reality it’s a reflection of how I was brought up, photographically speaking. In the advertising world, a photographer controls everything within the frame, including the background, the people/models, what they wear, the time of day when the images are shot, the amount of lighting that can be brought to bear on a particular subject, and even the expressions needed to get the desired result. While I enjoy the challenge of shooting “from the hip” so to speak, it can quickly become quite frustrating if my “vision” for what could be created is not matched with the reality of what is possible. With this in mind, I made images that I thought would reflect what a “first-time” visitor might be interested in. This included details, some of the many characters that were present, a few landscapes, and yes, even aircraft. While having lunch on Saturday (the next-to-last day of the Races) I received a text from Caroline that she may have a job for me...with no specifics, other than it would be a “short notice” thing. I had my extra gear stashed in a locker on site, so I was ready to go with just a few moments notice. There was no mention of who or what it might be. About three o’clock that afternoon, another text was received that mentioned the subjects were to be none other than Bob Hoover and Steve Hinton, for use in the magazine. I was specifically instructed not to mention this to anyone, for fear that a photographic stampede at the appointed time/place of the shoot might develop. It was a bit funny to me when, later that evening at dinner with several friends, Bob’s name came up in conversation. Of course, I had to resist spilling the beans, and only much later was I able to mention the shoot. At 7:30 the next morning (Sunday), I met Caroline and two other gents at the Press Center, for a quick briefing of what was to transpire. Introductions were made all around, and it turns out the other two were to “assist” me in whatever way necessary to make the shoot go smoothly. Of course, not knowing who they were, or their background, it was a bit disconcerting, but since they were really just an extra set of hands, I wasn’t too worried about it. Brightly colored lime-green photo vests were procured, and the required safety briefing was obtained, so that we could properly conduct ourselves out on the flight line, where the shoot was to take place. My assistants and I, just after the shoot…looking like "the usual suspects." At about 08:45, we were escorted out to the flight line, in front of the T-33 pace plane that has historically been used to control the start of the unlimited races. It turns out that Bob and Steve are the only two pilots to have ever flown the pace plane at the races, which is why it was to be the background for their portraits I was to make at 9 am that morning. The sun was brightly shining without a cloud in the sky, CAVU in aviator lingo, for Ceiling and Visibility Unlimited. Good for flying...not so good for photography. The light was intensely bright, and my problem was to create a portrait, quickly, that allowed the two gents to be captured in “pleasing” light, without blinding them with the sunshine. Therefore, I decided to place them on the “shady” side of the aircraft, which would serve as the background. By doing so, they would be facing away from the bright light of the sun, allowing them to keep their eyes open, and faces relaxed. The sun would also serve as a “rim light,” which helps to separate a subject from the background, when the tones are otherwise similar. The small softbox and strobe was set up to light their faces, and my Canon strobe was placed atop my camera, to provide a bit of fill light, even though it was turned down about 1.5 stops from the main light. In other words, it was not as bright as the main light, but provided some needed fill light in the shadows, thereby providing a bit of control to the overall contrast of the main subjects. One of the vertical images, shot as an alternative for a possible cover. The images were created using an aperture of F9, for two reasons. One is that my Norman strobe, at 200 watt/seconds and with a softbox over the front, couldn’t put out very much light, even at full power. The other reason was that I did not want to have everything in the shot in focus. I thought it would be OK if the plane was slightly “soft”, so that the viewer’s attention would be held on the two subjects, Bob and Steve, who were sharp. A total of 40 images were created, both horizontals and verticals, in six minutes and 26 seconds. I didn’t want to move Bob around too much, as he was quite frail, and probably wouldn’t have tolerated much movement. This limited my background somewhat, so I chose to move Steve (and myself) instead, from one side to the other, thereby providing Caroline some variety to choose from. The vertical images might have even been a contender for the cover, should a really excellent image have resulted, something to always keep in mind when shooting editorial work. Steve was a bit “antsy” too, as he had to go fly the T-33, as soon as we finished, so he was not able to stay for very long anyway. Once we wrapped up, we were escorted off the flight line quickly. There, Linda Shiner, the magazine’s editor, greeted us with tears of joy...at least I took it that way. Never did quite figure out why she was so emotional, but she did seem pleased, so I didn’t worry about it too much. Of course, the images were embargoed for a year, which means that they were not used in the magazine until the “Reno” issue the following year, which is also not that unusual in the editorial world. During that time I also agreed to “sit on them” and not show them in any way, until they were used in the magazine. Several months after the image was published I got the idea to have several prints made, which I sent around for autographs. Everyone graciously consented, and autographed copies were delivered to Steve and Bob, and to Linda and Caroline, who said no one had ever done that before. My autographed copy hangs above my messy desk, and is a lovely reminder of the day...especially so, now that Bob has “flown west…”.